What is error 2 and error 7 on a Pixma MP140 printer? Can I adjust the print shade on my Pixma MP140 printer? I can't find the area where it says how much ink is in the cartridges for the Canon Pixma MP140 printer. Please help as I live in a rural area and I don't want to run out of ink when I can't get to the city in order to buy some more? My ink is "FINE" number 30 / 32 or 40 / 41. I have a Pixma MP140 printer and have bought a black cartridge from you. The code is CRPG40. It says it's compatible with the Canon Pima MP180/450/460/150/160/170 but there's no sign of MP140 on the box? We can confirm that as long as you've received a compatible Canon PG-40 black ink cartridge it will work in the Canon Pixma MP140 printer. The models shown on the cartridge box are not an exhaustive list of printers so there can be other printers that are compatible to the product. Is Canon MPF140 the same as the Canon Pixma MP140? I have the former. Also, have Lexmark S405. I ordered a black cartridge only for an MP140 Canon printer which I got from my mum (unused) but she has lost the instructions. The printer doesn't seem to work with one black cartridge only as I do not need colour. Therefore, I didn't purchase a colour one, only black... When I try to print it says that the printer cannot read the colour cartridge. It's either inserted wrong or incompatible but I have left this slot blank and only have one installed in the black section. Can you advise? Thank you, Rena. Printers generally need both/all cartridges to be installed in order for them to operate. You will need to install a colour cartridge which contains ink. My computer crashed and everything was wiped off. I don't have the CD (English version) that came with the 'Canon All-In-One MP140 printer / scanner'. I don't have the manual anymore either. Is there anyway I can get this back? Unfortunately, we are unable to supply the manual and software for this printer, but you should be able to obtain this directly from the Canon website. Do you ship to Malta? If so, how much will it cost and when will it arrive if I order today? Unfortunately, we are unable to ship to addresses outside of the UK. I have been given a Canon Pixma MP140 printer and have no instructions or software to load it onto my computer. Where are these available please? Please can you tell me why the hazard light is flashing after putting a new ink cartridge in? This could indicate various issues such as a problem with the ink cartridge or an incorrectly installed ink cartridge. If you're experiencing difficulties with any item bought from Cartridge Save then please call our customer services department at your earliest convenience. Can you supply the Canon CL-51 printer cartridge or can I only use the Canon CL-41? The Canon Pixma MP140 printer does not use the high capacity tri-colour Canon CL-51 ink cartridge so you will have to purchase the tri-colour CL-41 ink cartridge for this particular model. If speed is your thing, then the Canon MP140 inkjet is the perfect printer for you. Not only does the MP140 churn out 20ppm but its built-in copier will turn around an impressive 19ppm, making this the ideal printer for anyone in a hurry. 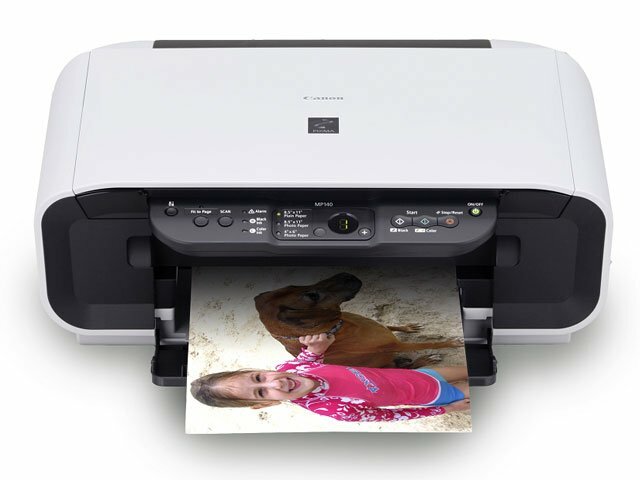 The MP140 is part of Canon's PIXMA all-in-one range which means you get a lot more bang for your buck - a scanner, copier and printer to be precise. Canon have opted for a futuristic, modern design for the MP140. The white cube has a central control panel which allows you to cancel copy and check ink levels. The Canon MP140 inkjet printer also comes with the brand's unique Z-lid design which allows you to scan large, thick originals like textbooks without any reduction in quality. At the rear is a single high-speed USB connection port for super quick spooling times. The main advantage the MP140 has over its rivals is the speed at which it can print, perfect if you need to work with large text documents or graphic rich articles. Canon have really focused on optimising the hardware and software to create a printer that works at maximum speed, from the printer right through to the scanner and copier, you will struggle to find an entry-level home printer that offers the same performance. It would appear that Canon have focused too heavily on the speed of the MP140 printer and neglected the output quality. Colour graphics were disappointing with fading, contrast issues and even some banding. Both the scanner and copier struggled with photographs, producing mediocre results. Having said that, the printer produced crisp, sharp text even at the smallest of fonts, reaffirming that the Canon MP140 inkjet printer is an entry-level inkjet designed for the home market.